A cold front will bring a few showers to the FLX late Friday and Friday night, but the weather should be great the rest of the time through the weekend. 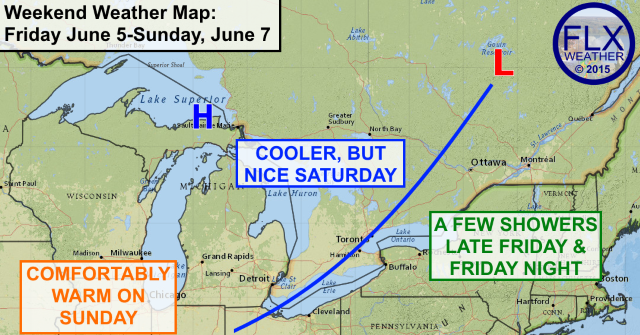 The Finger Lakes region will enjoy some very pleasant weather over the coming days, including the weekend. The only time period that is a little more questionable will be Friday afternoon into Friday night as a cold front moves through. Besides that front though, the weather over the next few days will be great. Thursday should transition from mostly sunny in the morning to a mix of clouds and sun for the afternoon. High temperatures will be right near normal values in the low 70s. Mostly cloudy skies overnight will keep temperatures in the low and mid 50s. More clouds than sun should be expected on Friday, though some breaks in the clouds will be possible, especially early in the day. Rain showers during the daytime should be limited to the afternoon hours, but these will be scattered and light. Many areas will probably not see any rain until after dark. High temperatures on Friday will be in the mid 70s. 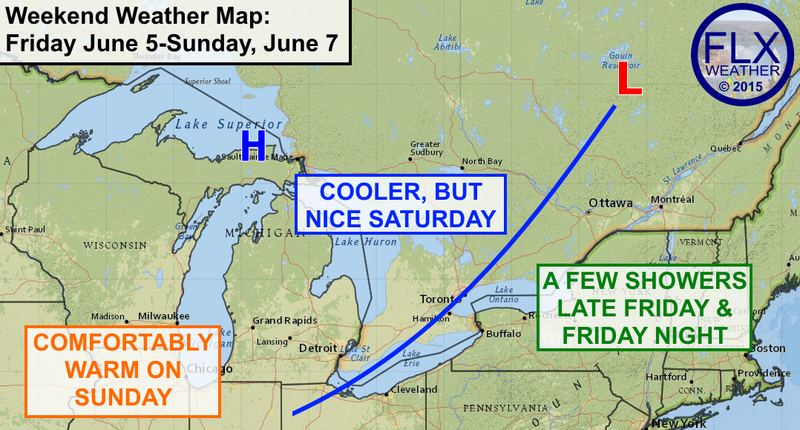 By Saturday morning, the front will have progressed through the region and clouds will be departing the area. The sun will dart in and out of a few fair weather clouds the rest of Sunday. Temperatures will be a bit cooler, with highs in the mid 60s, but with light winds and the sunshine, it should not feel too chilly. Temperatures will return to the 70s as southerly winds set up for Sunday ahead of the next weather system. The majority of the region should make it into Sunday night without seeing any more rain, but a few isolated showers will be possible Sunday afternoon, especially across the western Finger Lakes. The next chance for substantial rain for the Finger Lakes will come on Monday.